Today I took my boys to a San Diego County park called Dos Picos, a beautiful location in the East County hills, covered with lushy grass and lots of trees (a rare sight in San Diego). We first enjoyed some fun time on a large playground, then sat down by the pond of a picnic lunch, followed by an afternoon walk (and a unexpected run-in with a park ranger offering several activities for kids – how fun!). As we started eating lunch, we noticed a group of people setting up for a birthday party. It took us a while to figure out we were actually sitting at one of their reserved tables, but they were nice enough to let us finish before regaining use of the table. Take a look at what we got to witness happening right in front of us. It’s my first cow birthday party! Did you see the cow hide pattern tablecloth on the left? 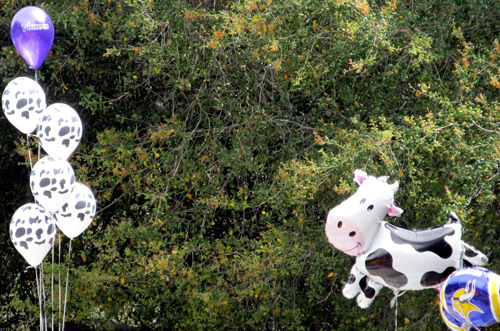 The cow balloon floating in the air? And the other cow balloon sitting on the right table? But wait, there’s more! 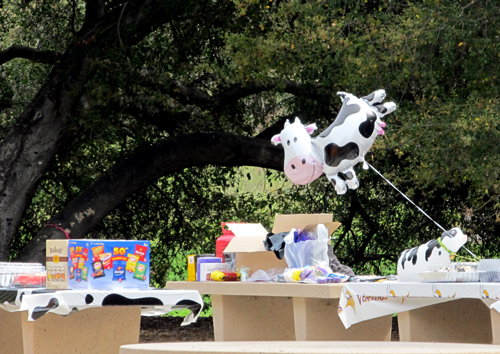 More cow balloons showed up before we finished our lunch. 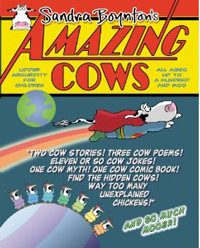 Phew, that’s a lot of cow sightings for a day, don’t you think? 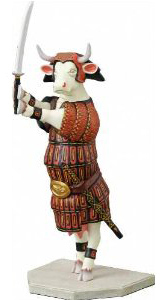 Previous Post Ever wondered what a real holy cow looks like?